I was recently working on a Personal Finance Dashboard and had to rank the returning data in descending order based on spending. I know this can be done on the query side using the sort functionality, however, I was trying to apply ranking on a subset of data returning from a main query, which was not in the desired sort order. In the end it was pretty straight forward. For demo sake, I’ve imported a small sample source data into the Excel model. This is the same data as that of the main query that I was talking about earlier. Drop in any Selector component with “Filtered Rows” capability. 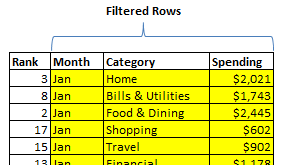 Configure it to insert filtered rows based on “Month”. Since the number of categories might be different for each month, picking the number of destination rows might be a little tricky. A simple rule is to analyze the source data a pick a month with maximum categories and use that number for destination rows. 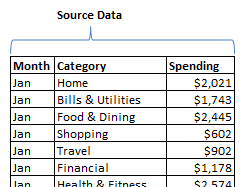 Apply the RANK formula on the “Spending” column of Filtered Rows. Hard code numbers from 1 through N (Max no. of categories). We will use this to look up values from the filtered rows range. Lastly, apply VLOOKUP using the Hard coded numbers as “value” and the Filtered Rows as “table_array”. Do this to get both “Category” and “Spending”. Do you know a better way to do this? Please use the comments section to share your trick. Thanks! Posted in: Dashboards, Excel, Tricks. Hi Kalyan, why don’t you just use the ‘Enable Sorting by data’ option in the charting components? Yes, that works perfectly for charts. The issue is with the Spreadsheet/Scorecard components. Don’t forget that you need to modify that Rank formula a bit or it won’t be able to break ties. I actually find myself doing this often when I’m overlaying a bar chart on top of a spreadsheet component. Especially since the Bar chart puts the data in reverse order! can you suggest me a good xcelsius2011 book for a beginner .Is it easy for me as i don’t have knowledge of previous xcelsius products. Hi, I want to know if i have morethat one in the ranking example I have (10 number de same value) How I could the ranking show all the ten value??? this file was created with a newer version 2008 sp3, coul you please send to me a version 2008 for opening, thanks a lot.